For years now, each time I start a new year of teaching The Book of Mormon, I have given a special challenge to the class. 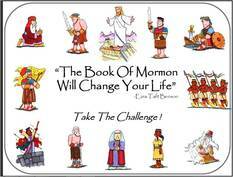 Ezra Taft Benson has declared, “The Book of Mormon will change your life.” So each year I give the class the challenge to see if the book will change their lives. The bookmark (see below) and poster almost explain it all. I have read the associated quotes with the class (on the back of the bookmark) and then ask, “What would a person need to do, to see if the Book of Mormon will really change their life?” and then the class will list things like, “Study it”, “Pray”. Then I talk about how they will probably never have a better opportunity to study the Book of Mormon in detail like they will this year in class. Then I give them the challenge found on the book mark (read through it). 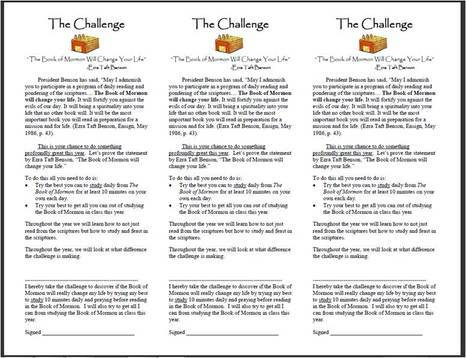 For all those that want to take this challenge, I ask them to sign their names, cut it off on the dotted line, and give that commitment paper to me. Then I ask them, “What kind of changes would the Book of Mormon make in someone’s life?” To answer that I list the following verses on the board and break them into groups of 4. Each group member has the responsibility of one of the references to share with the rest of the group, what change the Book of Mormon could have in their lives, according to the verses. The poster looking graphic is simply something I have up in the classroom as a reminder of this commitment. Hope this is helpful. I think it has really helped students with their personal reading, testimonies, and engagement in class. 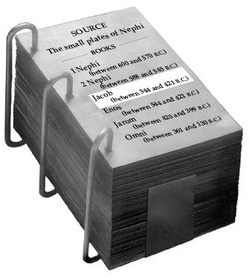 Here is a glue-in that can be helpful in teaching many places in the Book of Mormon (Intro, 1 Nephi 9, Words of Mormon…) The glue-in helps your students understand how the plates that were given to Joseph Smith were organized. 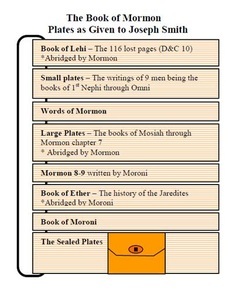 Page 577 in The Book of Mormon Seminary Teacher Manual also explains the sources of where those plates came from, as well as the video for this year. But the glue-in is a simplistic version. Hope this helps. 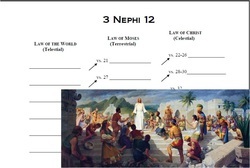 Here is a simple work sheet that can work with 1 Nephi 18. The first page is what you would give the students, and the second page is a key for the first two columns. 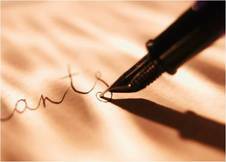 The worksheet helps them discover the story line, and then apply it to their lives. Here is also a glue-in for 2 Nephi 2:25 and 27. Notice that this is a Double Glue-in meaning that you can go to the copy machine in the library, and set it for double sided and it should line up so there is the powerful quotes for both sides of the glue in. Be careful lining it up when you cut them out. One of my favorite places in the Book of Mormon is “The Psalm of Nephi” in 2 Nephi 4:15-35. 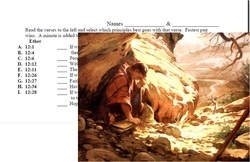 And one of my favorite activities of the year is letting the students be inspired by Nephi’s words, and then having them write their own psalm of praise. I have always been impressed with the students’ inspired words. Have them read the assignment on the handout, and then give them time to compose their psalms on the back. Then read them to the class according to their wishes as check on the front of the assignment. I promise you will be impressed. As teachers, we are to help our students learn to identify doctrines and principles in the scriptures. This can be difficult because most of our students haven’t really learned what doctrines and principle are. This Jacob 1&2 worksheet helps them in the initial step of seeing what well written statements of doctrine and principle look like. 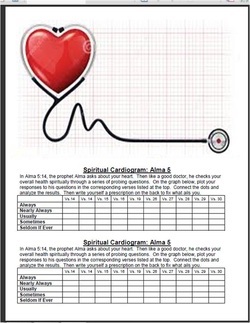 It is also a spring board to teach those powerful doctrines and principle to your class. After they have gone through the worksheet with their partner, have different groups read the verses and ask the class what they picked and why. Ask why that is an important doctrine or principle to know for life. Here is also a glue-in to help. Notice this is a double sided glue-in so you can print and then have your ward copy machine make it double sided. Great information on both sides. Make sure at one point you have them cover the right side and guess what each of the elements represent; or do this on the board before hand. It is a good review activity the second day. Don’t forget to use the video also. Make sure they come away with the big principles mentioned in the manual. The document also has it small to make handouts for the students. 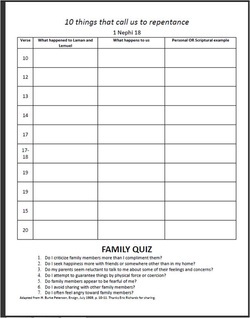 Here is also a document to quiz their knowledge by applying it to situations. Here are a couple of worksheets I have used to teach Alma 5. They work well because they direct the students through almost the whole chapter. 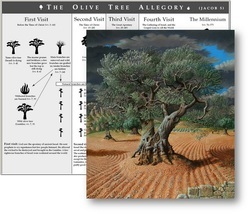 As the glue-in explains, a chiasma is an ancient Hebrew literary form in which the author paralleles the ideas and words he used previously in reverse order. It was considered an artistic form of writing in the Bible. 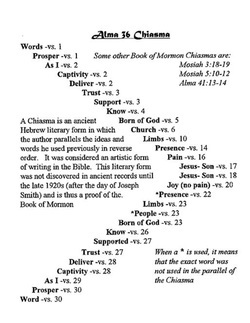 This literary form was not discoverd in ancient records until the late 1920s (after the day of Joseph Smith) and is thus a proof of the Book of Mormon. Show your class how the words are repeated in the verses. Also show how the apex points to verses 17-18 and what this teaches. Here are some ideas for teaching the War Chapters. While giving lesson ideas, I wanted to demonstrate how quickly you could go to some key verses, give a good “Look for”, follow up with good questions, and then have the students come up with good “Take Aways” that you hope would stick with them. The text in Red is what I might invite them to write in their own scriptures. Short and sweet. 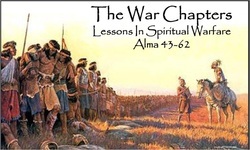 Remember the key to teaching the War Chapters is after talking about their literal warfare, ask what it teaches about our "spiritual warfare" we are engaged in each day. Hope this is helpful. Also, there is nothing here which would require you to use a PowerPoint or projector. 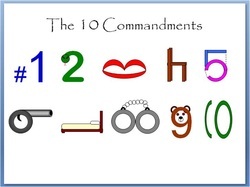 I just used this in the Inservice so we would not spend so much time turning to the key sets of verses. Here is a simple glue-in to teach about the pride cycle in Helaman and 3rd Nephi. 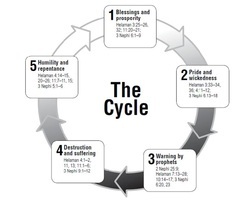 Often when teaching the storyline in Helaman, I would stop them and point to the Pride Cycle and ask, “Where does it seem like the Nephites are on the cycle right now? Where are the Lamanites on the cycle?”. It is also good to ask them were the country is right now. Then go personally and have them think to themselves where they currently are on the cycle and what will likely happen next. I also have it so you can print it out and stick it to the chalk board. See if they can put together the cycle. 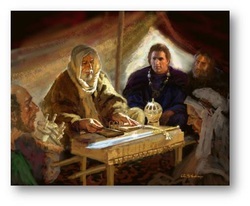 3 Nephi 12 Worksheet "But I Say Unto You..."
In 3rd Nephi we have the Savior teaching one of the greatest sermons ever given, which He also gave to the people in Israel. In 3 Nephi 12:21-48 we have the Savior giving the Higher Law and contrasts it to the Law of Moses. Have your students write in the middle column what the law was under Moses, and then summarize the Higher Law in the right column. In the left column they will need to speculate what the World’s law is in the matter. 3 Nephi 27:27 was a Scripture Mastery 4 years ago, and is naturally still a wonderful scripture. As members of the Church we are to strive to follow Jesus Christ in word and deed. Each Sunday we take upon us the name of Christ which means to try to do as he would do. 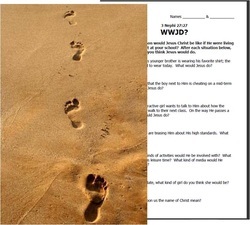 This worksheet has your students ask WWJD? (What Would Jesus Do?) in various modern circumstances. After they have had some time to do the worksheet with a partner, give time to share about what they decided. Make sure you challenge them to ask themselves WWJD? and then go and do likewise. By the way, many have wondered where the whole WWJD? thing came from. It comes from a book called In His Steps. It is a best-selling book written by Charles Monroe Sheldon. First published in 1897, the book has sold more than 30,000,000 copies, and ranks as one of the best-selling books of all time. For me, it is one of the top 10 books I have ever read. You can get a e-book or Kindle of it for practically free (if not free). It is a life changing book. President Ezra Taft Benson also thought very highly of the book and referred to it in speeches he gave and a book he wrote. 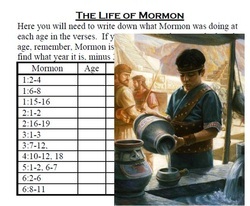 This glue-in is a worksheet that helps your students get to know the great prophet Mormon and the ages when these events happened. It also helps you hit the main principles taught through his life, so it can help cover many chapters quickly if you need that. I usually don’t include a KEY with worksheets I give out, but I have made an exception here and it is on the second page. 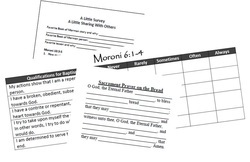 Here are some helps for teaching Moroni 4, Moroni 6, and Moroni 10.